Bill Whatcott's supporters pray over him just before he turned himself in for a "hate crime." June 2018. We told you this was coming. We warned you it would happen. We were not crying wolf. We were telling you the truth. And now it is here, as a headline announces: “Canadian tribunal fines Bill Whatcott $55,000 for expressing Christian views on ‘transgenderism.’” In other words, Whatcott called a biological male (who identifies as a female) a “biological male.” That was his crime. What a miscarriage of justice. What an assault of freedom of speech and expression. John Carpay, president of the Justice Center for Constitutional Freedom, defended Whatcott, noting in protest that, “The Supreme Court of Canada has long held that freedom of expression is the lifeblood of democracy.” But not when it crosses the lines of transgender activism. Freedom halts there. 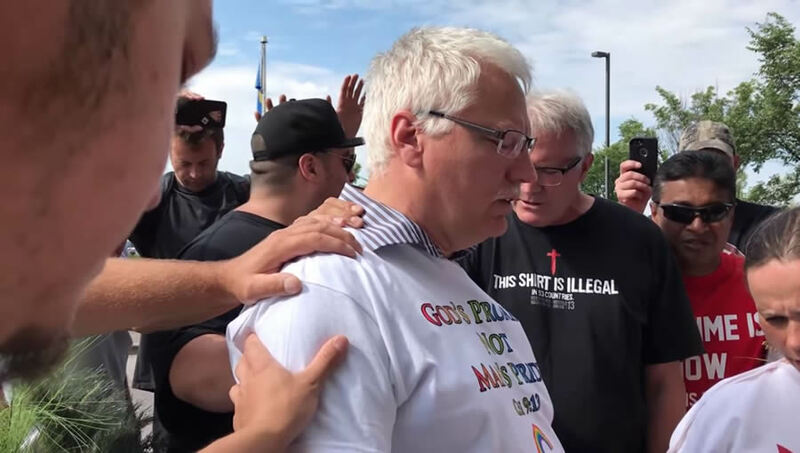 Now, in Canada, a Christian activist has been fined $55,000 for the “hateful” act of misgendering an adult male. How soon before this reaches America? Is the water hot enough for the frog to take notice? Tell that to Bill Whatcott. For that he was fined for committing a hate crime. So be it. People say offensive things day and night in countless public settings, and those freedoms are protected by the law. You’re entitled to that opinion. What is not debatable — meaning, it should not be debatable — is that Whatcott has the legal right to tell the truth about Oger. So, this is not the prediction from a “sky is falling” pessimist. This is a factual report from a biblically based realist. Expect this in a city near you in the coming days, unless you stand up and speak out today. As followers of Jesus, we can tell trans-identified people that we love them and wish them no harm without agreeing with their perceptions or affirming their choices. You have been forewarned. Again. Correction: An earlier version of this story said that Whatcott was arrested, held in jail and ultimately fined for stating that Morgane is a male. In fact, Whatcott was not arrested and jailed in the British Columbia proceeding. He was arrested and jailed for a separate incident in Toronto. The trial for that is scheduled soon. Read more here. The Toronto incident is related to Whatcott passing out flyers against homosexuality at Toronto’s homosexual pride parade in 2016.